Garibsons, Pakistan’s largest Exporters of Premium Quality Basmati Rice, will be exhibiting at the China International Import Expo (CIIE), taking place in Shanghai. This is China’s first large-scale Import/Export expo which has been graced by the President of China, His Excellency Xi Jinping. Pakistan Prime Minister Imran Khan will also be visiting the exhibition. 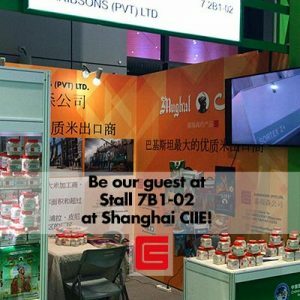 The CIIE is taking place at the National Convention and Exhibition Center in Shanghai from 5th November to the 10th of November, 2018. Visit Garibsons (Pvt) Ltd at our stall# 7B1-02! We look forward to welcoming you!